Could it be that instead of or in addition to ATOMOS, there was a word AUTOMOS – to suggest a BASIC PRINCIPLE OF CREATION – to say that it is SELF-PERPETUATING or… SELF-CREATING? Looking at the “self-creating” and “self-perpetuating” seasonal emergence of life, would it be that hard to conceptualize that the entire world may be “blooming into existence” very much like a plant, and that “autonomy” is embedded in the basic nature of existence? Can the Universe be viewed as a “Garden of Creation” so to speak – a self-creating and self-perpetuating reality? This is to say that there is no need and really no evidence of a remote and separate “authority of creation” that communicates to and commands over “his” creations – such as humans – as some external agent – such as was asserted in the Bible. Neither is there a need or evidence for a collective action of “thetans” – all powerful spiritual beings that have become “trapped” within the system of their own creations in human bodies – such as the assertion in the basic tenets of Scientology. Both of these viewpoints deny the evident fact of self-sustaining and self-perpetuating nature of Creation and the self-guiding nature of different forms of creation within it. A rock stands still on its own. A tree grows on its own. The human body creates itself – as a manifestation of the interconnected and complex system of intelligence of various life forms that work together to create a whole. [Yes of course none of these forms emerge completely self-contained in some “vacuum of creation,” but this is to say that these forms emerge autonomously within a larger creation that is based on a complex system of relationships]. An easy way to visualize this is to imagine a “cloud” or a three dimensional “field” pervaded with Consciousness (pure aware intelligence) that creates reality within that “field” by forming ever more complex creations – from simpler to ever more complex and aggregate / composite forms of creation. A human being is a manifestation of this process of creation – an epitome of intelligent “engineering” and a more “perfect” manifestation of the Consciousness of Creation in form that has the potential of becoming aware of itself within its own Creation. 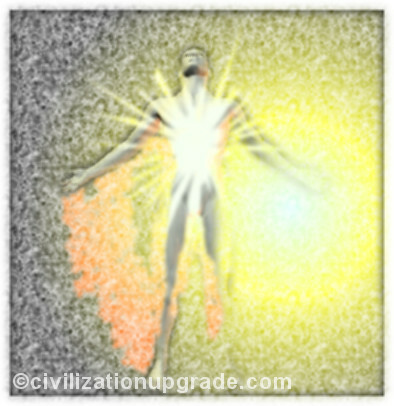 The progress of man’s spiritual evolution is to progress from being a form in the “Garden of Creation” to a self-realized and self-aware consciousness of creation in (human) form that is able to transcend (move / expand beyond) the form as pure consciousness that it is. An experience of “enlightenment” can be achieved by directly contacting, with one’s conscious awareness, the Energy of Creation within oneself which is seen as a “fiery light” emerging from within and through one’s own being – light is the way human mind “sees” energy. The unification of one’s individualized consciousness with the overall Consciousness of Creation results in a sense of self as being everything (being “one with everything”) – experiencing the Self of Creation – which fills the body with a pervading sense of euphoria and healing and floods the mind with a stream of insights into the nature of reality resulting in the emergence of true knowledge and understanding. Ability to “feel through” the environment as through one’s own body – “extrasensory perception” – opens up as well as expanding ability for empathy and telepathy – perception of and communication through “psychic” energy within human consciousness and that of the natural world at large. Pass the initial period of euphoria, in a realm that has large amounts of pain and suffering this expansion of perceptibility can lead to an overwhelming experience as one suddenly becomes directly aware of the realities of suffering of sentient beings in the realm. “Personal responsibility” then expands over a wider realm of Creation that is in need of help and improvement toward a more constructive and joyful condition. When we view something as a separate form, that “view” is a perception construct – a vision of reality created by our intelligence. Hence, when someone experiences a shift in the state of consciousness, it comes accompanied by a shift in the perception of reality. And when someone’s level of intelligence rises, their ability to perceive different aspects of reality (in greater depth, in more details, over a wider spectrum and volume, seeing something that was not seen before… etc.) also increases. Here are a few analogies to visualize the construct of creation. The Symphony of Creation: Creation is like music. There are musical notes which are harmonics of vibration – atoms. These notes can be formed into chords – molecules. And the skilled combination of notes and chords can be used to create a symphony. You are a piece of music in the symphony of creation. The Story of Creation: Creation is like a story. There are different letters – atoms – which can be formed into words – molecules – which then can be combined in line with some structural principles (rules of grammar) into sentences and sentences into a perpetually unfolding story. You are a character (persona) in the unfolding story of creation. It’s an ongoing live performance. (Self-assembling, autonomous) structures of increasing complexity. How can a sand castle be built without sand? And so with the basic, but nevertheless complex, structures of matter which can then be utilized in building various forms of life. MOSS is a type of “self-perpetuating” plant. Think about how the concept of AUTO-MOSS may relate to the creation of “raw” matter which continues to grow in complexity to then result in a diverse array of self-perpetuating life forms such as a bacteria and bacterial aggregation which continue to grow in complexity to result in multi-cellular organisms and aggregations of those organisms such as various forms of human civilizations. Relating ATOMOS to AUTO-MOSS may not exactly be linguistically correct but it’s an interesting concept to entertain.